Sketchbook Project Vehicle TRUCKS 38 n Performance & Hotrod Business n January 2015 2015 GMC 3500 HD Dually Truck Covers USA presents the U.S. Marine Silverback Raider, a 2015 GMC 3500 HD dually project truck, featuring the company's American Roll Cover. 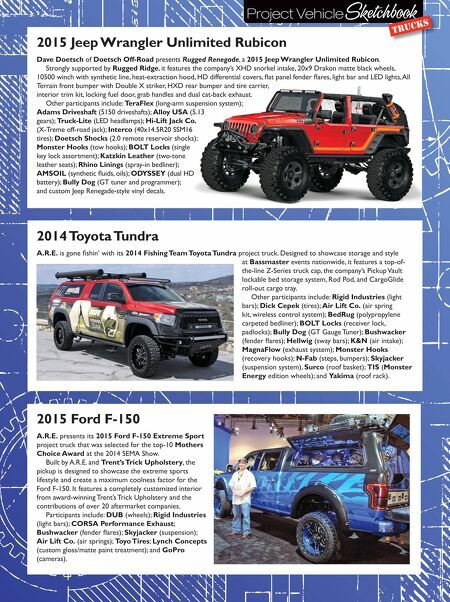 Participants include: Interco (SS-M16 37-inch tires); American Force (Scope 24-inch wheels); Rize Industries (10- inch lift); Rigid Industries (LED lighting); N-Fab (bumpers and steps); LINE-X (spray-on bedliner); Katzkin Leather (custom interior); Webasto (sunroof); WARN Industries (winch); Monster Hooks (hitch hook); and Mag-Hytec (differential cover). 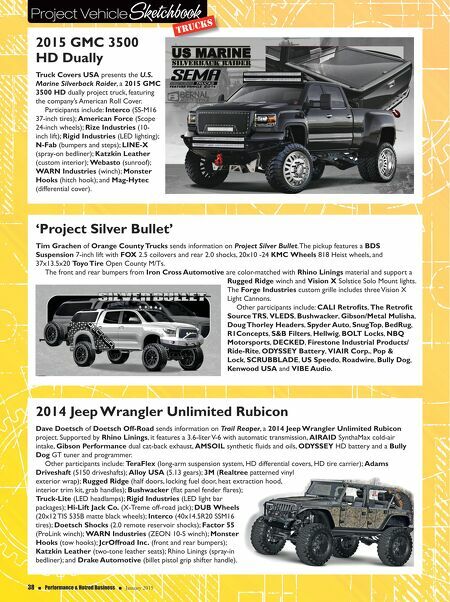 2014 Jeep Wrangler Unlimited Rubicon Dave Doetsch of Doetsch Off-Road sends information on Trail Reaper, a 2014 Jeep Wrangler Unlimited Rubicon project. Supported by Rhino Linings, it features a 3.6-liter V-6 with automatic transmission, AIRAID SynthaMax cold-air intake, Gibson Performance dual cat-back exhaust, AMSOIL synthetic fluids and oils, ODYSSEY HD battery and a Bully Dog GT tuner and programmer. Other participants include: TeraFlex (long-arm suspension system, HD differential covers, HD tire carrier); Adams Driveshaft (5150 driveshafts); Alloy USA (5.13 gears); 3M (Realtree patterned vinyl exterior wrap); Rugged Ridge (half doors, locking fuel door, heat extraction hood, interior trim kit, grab handles); Bushwacker (flat panel fender flares); Truck-Lite (LED headlamps); Rigid Industries (LED light bar packages); Hi-Lift Jack Co. (X-Treme off-road jack); DUB Wheels (20x12 TIS 535B matte black wheels); Interco (40x14.5R20 SSM16 tires); Doetsch Shocks (2.0 remote reservoir shocks); Factor 55 (ProLink winch); WARN Industries (ZEON 10-S winch); Monster Hooks (tow hooks); JcrOffroad Inc. (front and rear bumpers); Katzkin Leather (two-tone leather seats); Rhino Linings (spray-in bedliner); and Drake Automotive (billet pistol grip shifter handle). 'Project Silver Bullet' Tim Grachen of Orange County Trucks sends information on Project Silver Bullet. The pickup features a BDS Suspension 7-inch lift with FOX 2.5 coilovers and rear 2.0 shocks, 20x10 -24 KMC Wheels 818 Heist wheels, and 37x13.5x20 Toyo Tire Open County M/Ts. The front and rear bumpers from Iron Cross Automotive are color-matched with Rhino Linings material and support a Rugged Ridge winch and Vision X Solstice Solo Mount lights. The Forge Industries custom grille includes three Vision X Light Cannons. Other participants include: CALI Retrofits, The Retrofit Source TRS, VLEDS, Bushwacker, Gibson/Metal Mulisha, Doug Thorley Headers, Spyder Auto, SnugTop, BedRug, R1Concepts, S&B Filters, Hellwig, BOLT Locks, NBQ Motorsports, DECKED, Firestone Industrial Products/ Ride-Rite, ODYSSEY Battery, VIAIR Corp., Pop & Lock, SCRUBBLADE, US Speedo, Roadwire, Bully Dog, Kenwood USA and VIBE Audio.